If you think setting up your own coffee company would be difficult, try also inventing a new coffee brewing and storage gadget. Those are just two of the daily challenges faced by Patrick Joseph, owner of Haute Culture Coffee Company and inventor of the COFFEEASY. Howard Mosley-Chalk caught up with Patrick to get his take on the perfect cup of joe. "I guess it all started growing up in France in the mid 70s," says Patrick, originally from London, but who now lives in Leeds. "I was mesmerized by my grandmother's morning ritual; grinding the beans, the noise, the smell of the fresh grounds, and a few minutes later, the smell of freshly brewed coffee. You could say I started ‘smelling the coffee’ early." Later in his life, while studying and working in Paris, Patrick learnt that cafés and coffee were important parts of everyone's life, from breakfast to after supper. "Cafés are a huge part of the culture there, and that hasn't changed. It’s here in the UK that the coffee and café culture has altered so much over the last ten to 15 years. The UK is getting more and more continental, I guess at the expense of the pub culture." And it was that change, combined with his upbringing in France, that spurred him to create Haute Culture. "That seems like a long time ago … McDonalds weren't even selling coffee then! The concept was to create an alternative to Italian coffees, to start a new business, learn about coffee, and develop the blends. Some took days, others took months. Then there was the whole thing of opening supplier accounts when no one has ever heard of you. Over the last few years we've learned a lot about people's coffee habits and brewing routines, but it’s all been fun and led to this new venture." 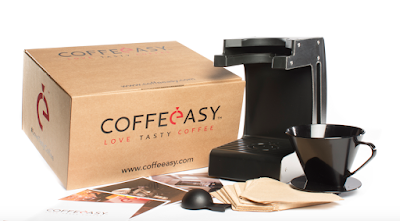 The COFFEEASY is a simple pour-over brewing and storage kit, designed for people who like to take the time to prepare themselves a tasty cup of filter coffee (read our review here). "I came to the conclusion that it was pretty hard for most mere mortals to prepare a barista quality espresso or cappuccino at home, even with good equipment and training. It is much easier, with a little bit of knowledge and curiosity, to produce a very decent filter coffee. One day the Mrs told me she was fed up with the space my coffee gear was taking up in the kitchen, and that was the light bulb moment: a stylish and easy to use stand and storage solution with all your equipment in one place. "Over the past two years our prototypes have become much better constructed and more sophisticated, with help from coffee consultant Paul Meikle-Janney. 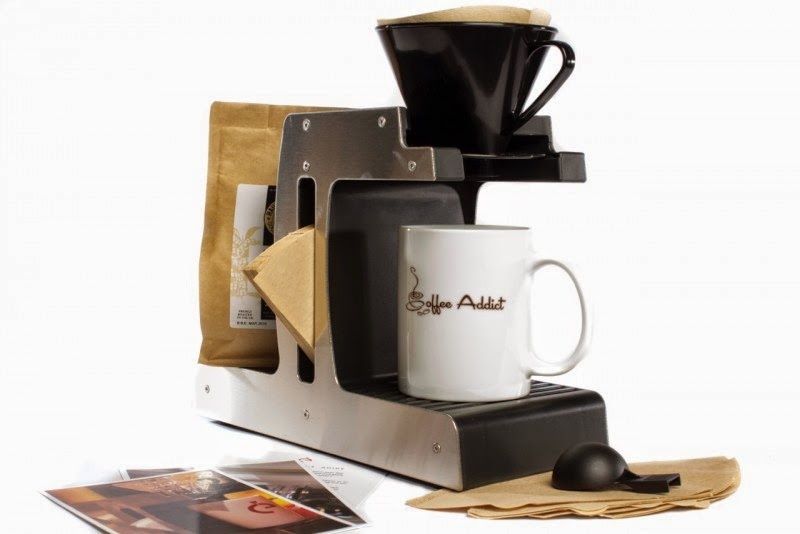 But the original objective remains the same: simplicity and flexibility... to make the best quality coffee at home without re-inventing the wheel." So for a person who is clearly passionate about coffee, how much of it does Patrick actually drink? "I don’t drink all that much coffee to be honest; about four cups a day on average. I’ve always had a preference for quality over quantity. It sounds clichéd but that’s genuinely how I feel about coffee. I'm very fortunate to receive samples from various UK roasters, which is great and extremely useful for all the testing and tasting I do on a daily basis. "But each day is different. It does, however, always start with a cup of coffee using the COFFEEASY of course! The brewing vessel, dripper, coffee, and water quantity changes a lot - that’s the beauty of it, the constant experimenting. Typically my six year old son will give me a shout when he’s seen the last drop fall into the cup while I am making breakfast. "Daddy, your coffee is ready!" is a daily morning call. Talking beans, I have a preference for coffee from Central and South America, but there’s so much great coffee out there at the moment." As the COFFEEASY hits the shelves of specialist coffee suppliers, does Patrick have other coffee innovations in the pipeline? "Yes, there are other ideas that are being developed, but it’s early days so I can’t say too much at the moment. Right now we’re focussing on launching COFFEEASY. All I can say is that we think the hospitality sector needs to seriously re-think their in-room coffee and hot drink offering..."